Sun Conures are native to a region of eastern South America that includes a Brazil that lies north of the Amazon River, Guyana, Suriname and French Guiana. 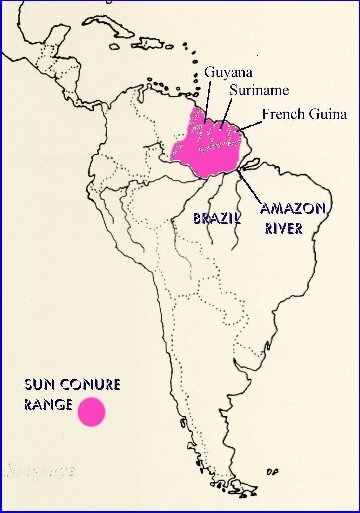 The areas they live in include Tropical rain forest some open forests, woodlands and savannahs. This area lies just above the equator so the days are about 12 hours long all year round. 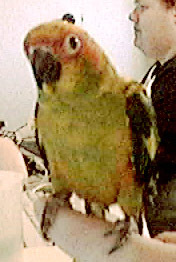 Sun Conures grow to be approximately 30 cm long and weigh approximately 100-115 grams. with green and blue tips with the tail being an olive green turning blue at the tip. colours he will have as an adult. variety of toys to play with. from the top of his cage whilst furiously attacking on of his many toys. the dog's whining, my husband's wheelchair squeeking and a clicking sound I taught him. this usually only lasts for a few very noisy minutes and the best thing to do is to ignore the noise.